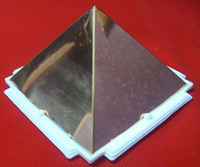 Pyramids with square base represents Earth, and triangle sides represents fire. The square base produces solid stable foundation for triangular sides. The triangle sides aspiration of fire towards heaven from earth provides tremendous energy to attract from the cosmos. Gagana Wholistic World is a Unique Center Established in Bangalore. Since 18 years serving people with services of Indian Vaastu consultation combining Chinese fengshui for interiors & Enhancer's. We recomend pyramids & German Geomancy techniques to rectify vastu corrections & to enrich earth energy fields.